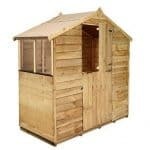 Shed-Plus supply a wide range of garden buildings, so there’s something for everyone. 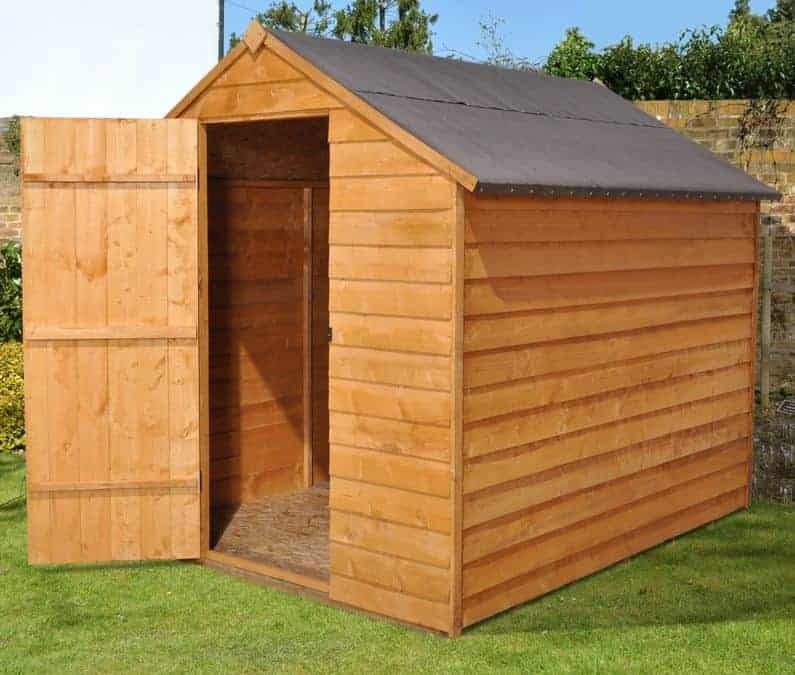 This shed is at the bottom end of their price range and yet is made of the same high quality materials the manufacturer is famous for. For this reason, it makes an ideal starter shed for a new homeowner, as well as a great value supplementary storage facility. The roof and floor are both made of a thick single sheet material, reducing costs at the same time as providing a strong and durable surface. Once the roofing felt is applied, this shed becomes very good at repelling rain, a task also achieved by the overlap cladding of the walls. There is no window in this shed, but we like the fact that this adds to its security value by preventing criminal eyes from seeing what’s held inside. 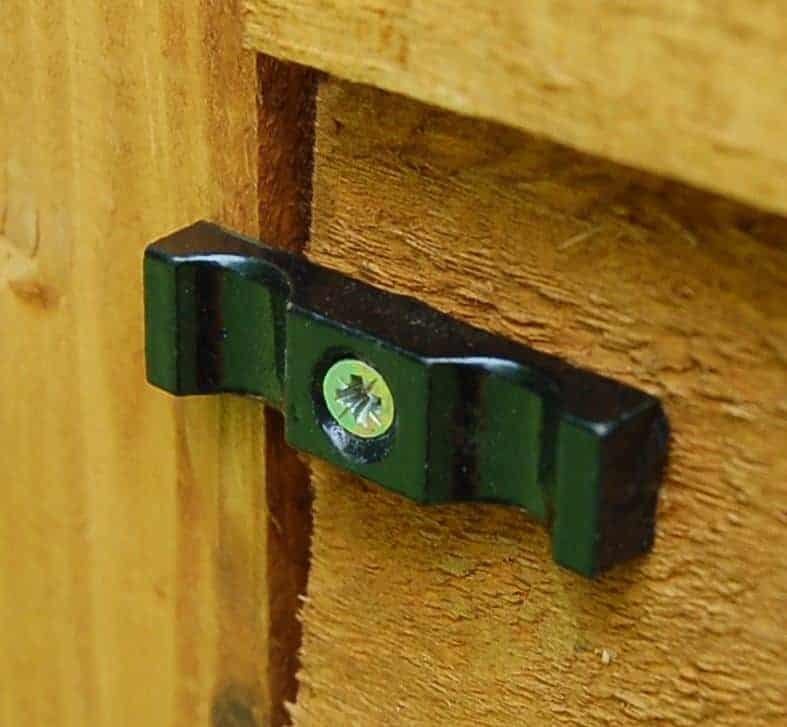 A padlock will need to be added for extra security, but if this is done then the shed becomes a highly effective storage unit for expensive tools and garden equipment. Although the 10 year guarantee supplied by Shed-Plus is dependent upon annual treatments being kept up, this is still a valuable added feature for a shed which costs as little as this. The first thing that struck us about this overlap security shed was its sheer size, when you walk into it you can appreciate just how much storage room it gives you, and the apex roof makes it even spacious. 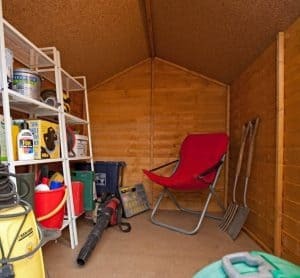 This means that it can not only take your mower, strimmer and garden equipment it can also be used to store household items, leaving you a home that’s free of clutter. At its highest point the roof is 2.05m tall, and the eaves height is 1.47m. The door is 1.70m tall, so you’ll find getting in and out easy, and the door width of 0.66m allows you to move equipment in and out without any difficult manoeuvring being required. 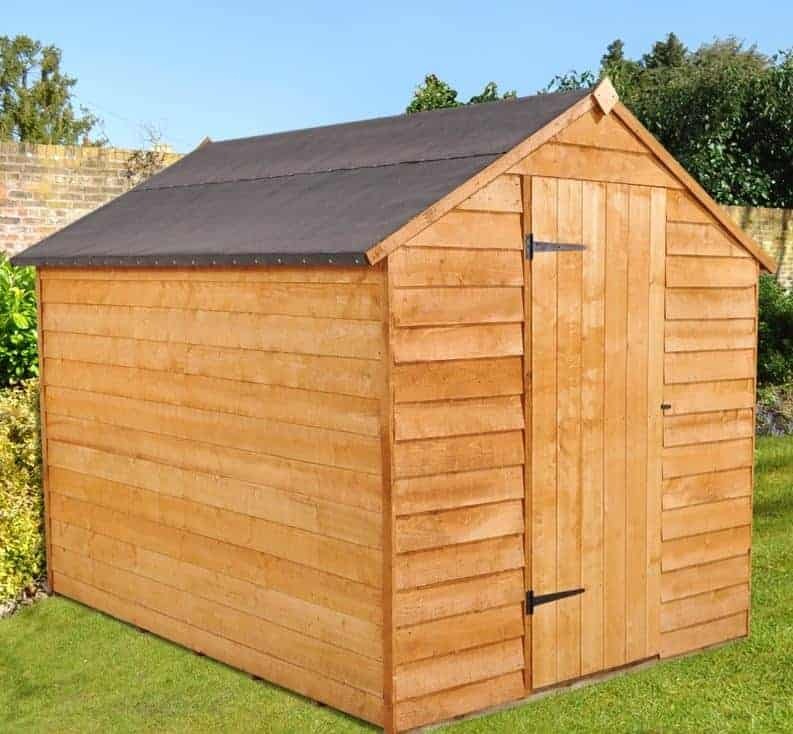 It is the depth and width of this shed, at 2.36m and 0.66m respectively, that it gives it true versatility and a generous volume. 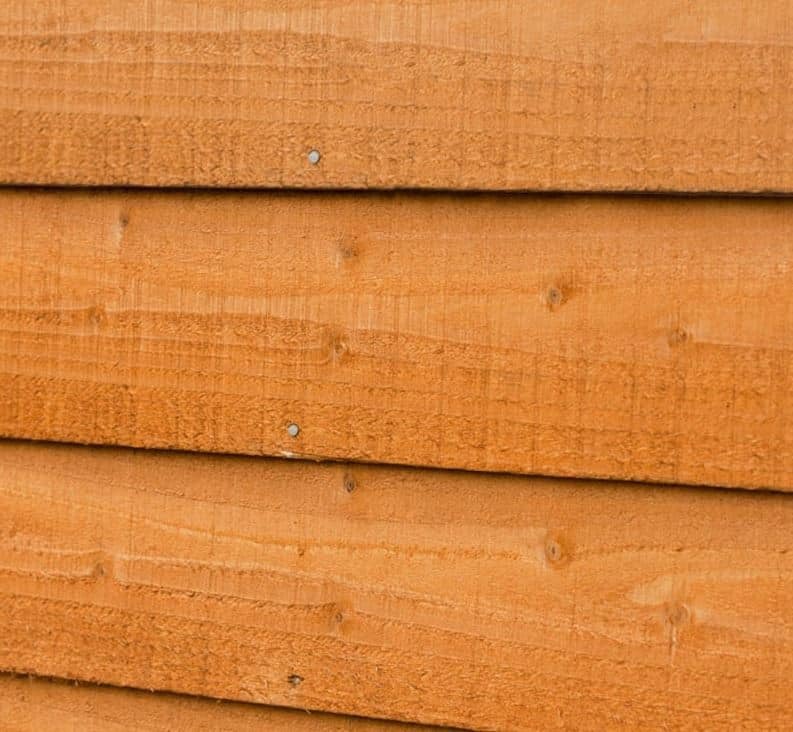 Overlap cladding is not as tough and durable as shiplap, yet the 7mm thickness of cladding used in this shed feels tough enough to withstand the vagaries of our weather on a day to day basis. The overlap design not only makes it easy to put together, and ensures that the shed is available at a low price, it also helps to stop rain or snow getting into the shed itself. The sloping apex roof also helps to carry water away, and we noticed how effectively the roof felt was repelling water that hit it. The frame of this shed is of standard build and thickness, and the floor, at 9mm thick and made of solid sheet material, felt reassuringly solid under our feet. There was no creaking or give in the floor, even when a heavy lawn mower was rolled into the shed. As with all shed floors it’s important that it is built upon a solid and level base that offers as little contact with the ground itself as possible. For this reason, we recommend the use of the optional do-it-yourself shed base kit. Pre-treatment of sheds, accompanied by a manufacturer’s warranty, add extra value for the consumer, so we were pleased to see that Shed-Plus scored highly on both these points. A dip treatment has been used on all the timbers, as well as pressure treated preservative being used on the floor bearers. 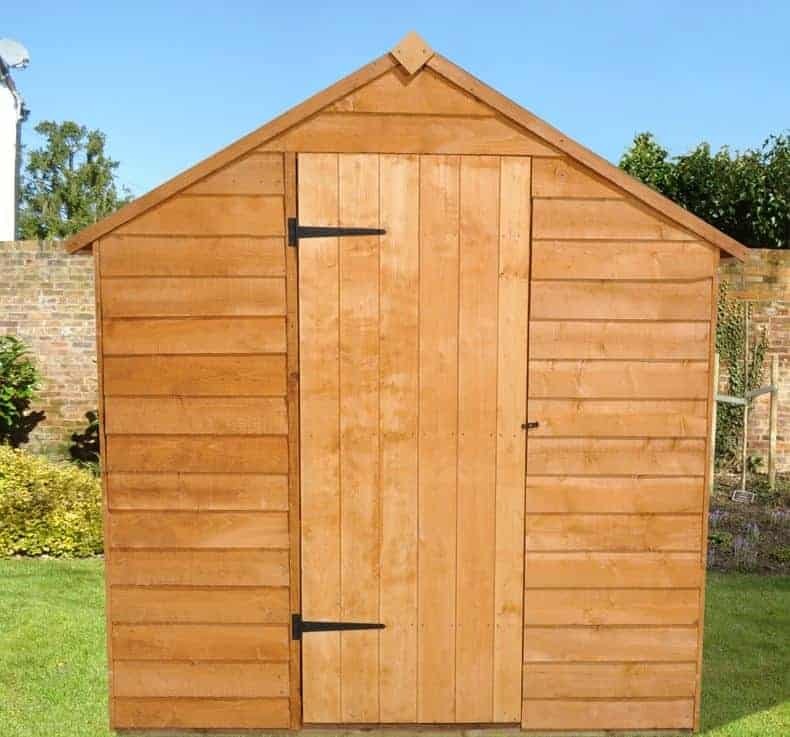 This high quality preservation means that Shed-Plus can provide a 10 year guarantee against rot. Rot is the number one enemy of shed owners, and can quickly take hold if the correct preventative measures aren’t taken. That’s why it’s essential to note that while the initial treatment gives excellent production at the start of the shed’s life, further annual treatment will be required and this is the responsibility of the shed owner. This will involve some expense, but will save the cost of repairing the effects of wet or dry rot and woodworm damage. We were pleased that the central door was large and wide enough to enter without having to bend time, making for much safer entrances and exits. One thing that did disappoint us slightly, however, was the the button operation catch is purely there to keep the door fastened, and doesn’t provide any locking function. 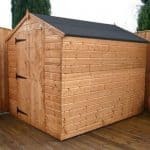 This can be expected from such a great value shed, and can easily be supplemented with one of the optional padlock and security systems. Once a suitable padlock is in place, the shed offers excellent security and protection for your tools and equipment because the shed is window-free. Without a window, there’s no way for an opportune shed thief to know what, if anything, is kept within the shed, as well as denying them a potential point of access through a window. For these reasons, your chances of a shed break-in are reduced. Security and privacy are both enhanced by the lack of a shed on this window. Not only will burglars be completely unable to see what’s inside, so will everyone else. Privacy is a valuable commodity in today’s society, and so if you install an internal lighting source you’ll be able to escape to your own area of peace and tranquility. It’s more than just a shed, it can be a place to relax in safety and comfort at the end of the day. 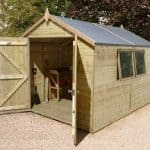 The 8’ X 6’ base kit is one extra that we heartily recommend for this shed, as it can greatly enhance the longevity without adding significantly to the overall cost. Easily assembled, it keeps the bottom of the shed level and away from the ground itself. The larger a shed is, the more important this becomes, as rising moisture from the ground can otherwise eat away at the timbers, especially as it will be difficult to retreat flooring once the shed in position. The base kit elevates the bottom of the shed above ground level, keeping it moisture-free. A padlock is also an essential addition to this shed, creating a low cost secure lock up when in place. 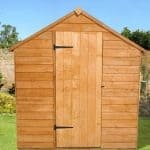 Optional padlocks that can be bought with this shed include a built in alarm, giving you added peace of mind at night time. Other optional extras include a set of four shed hooks with a chrome effect finish, as well as shed stains in either harvest gold or dark brown varieties. These attractive colours allow the shed owner to customise it to their own particular style. 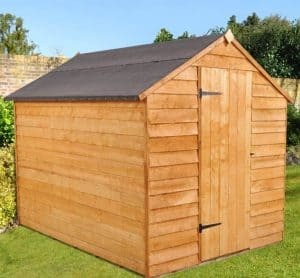 Despite being designed to appeal to the budget end of the shed market, it is still made from high quality material and looks and feels sturdy. 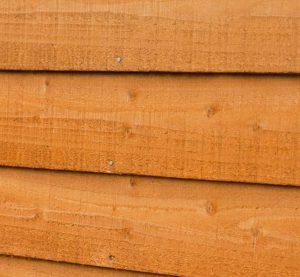 The dip treatment offers a good level of initial protection, but annual treatment is required to keep the warranty in place and to provide a lasting defence against rot and weathering. 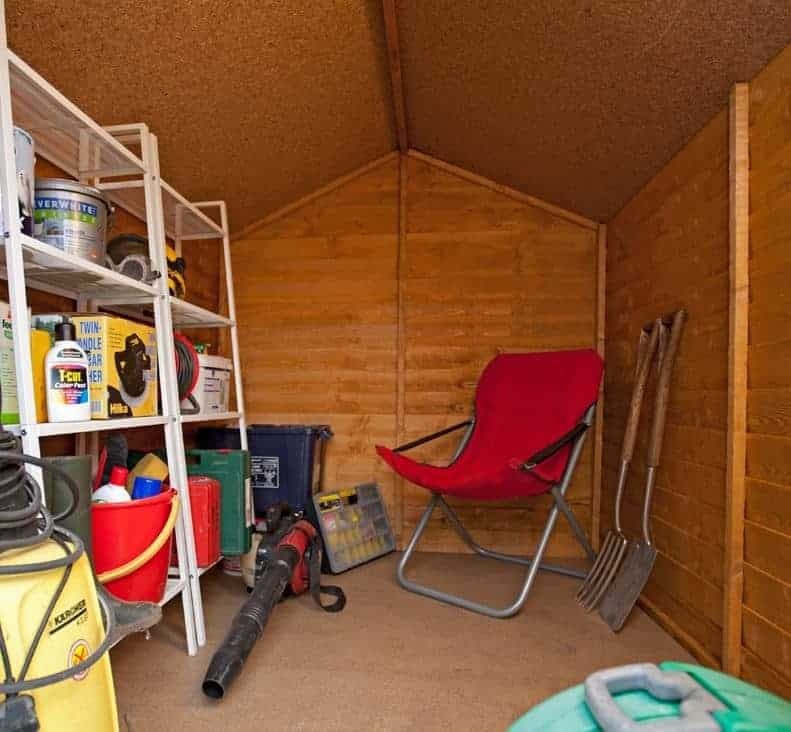 With an apex roof adding more space, this shed has a good storage capacity. The ability to add some shelves would have been nice, but there is still more than enough room for most people. Because of its size this can take a little construction, so read the instructions well before commencing the installation. We found that two people can fully erect the shed in under five hours. 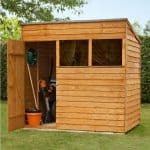 You wouldn’t expect to get a shed of this size, complete with a 10 year conditional anti-rot guarantee, for less than two hundred pounds, so this super saver overlap shed is a real bargain. 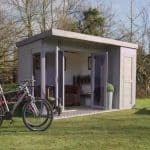 Final Thoughts: Good looking garden sheds don’t have to cost a lot, as Shed-Plus prove with this great value garden building. Solidly constructed, we were pleased with both the overall appearance of the shed and it’s apparent toughness. 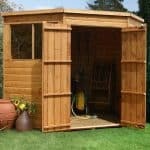 Even though this shed is at a super saver price, you can expect it to last and last if you keep up the required annual treatments, and the ten year guarantee is an indication of the quality of materials used by the manufacturer. A padlock is a must-buy accessory, but the window free design helps to ensure that the contents within stay safe and sound.